OBJECTIVE To help physicians become more comfortable assessing the fitness to drive of patients with complex cardiac and cognitive conditions. QUALITY OF EVIDENCE The approach described is based on the authors’ clinical practices, recommendations from the Third Canadian Consensus Conference on Diagnosis and Treatment of Dementia, and guidelines from the 2003 Canadian Cardiovascular Society Consensus Conference. MAIN MESSAGE When assessing fitness to drive in patients with multiple, complex health problems, physicians should divide conditions that might affect driving into acute intermittent (ie, not usually present on examination) and chronic persistent (ie, always present on examination) medical conditions. Physicians should address acute intermittent conditions first, to allow time for recovery from chronic persistent features that might be reversible. Decisions regarding fitness to drive in acute intermittent disorders are based on probability of recurrence; decisions in chronic persistent disorders are based on functional assessment. CONCLUSION Assessing fitness to drive is challenging at the best of times. When patients have multiple comorbidities, assessment becomes even more difficult. This article provides clinicians with systematic approaches to work through such complex cases. On the other side of the coin, reporting unsafe drivers is legally mandated in most Canadian jurisdictions,10 and even where it is not, physicians can still be found liable if they fail to report a patient who is later determined to have caused harm to others as a result of medical impairment behind the wheel. Accurate assessment of fitness to drive, however, allows physicians to help patients avoid disabling injuries or death and to help patients and their families avoid the grief and legal repercussions associated with contributing to the injuries or deaths of other road users or bystanders. To better prepare physicians to meet this important societal role, we present our clinical approach to assessing fitness to drive in the context of a fictitious case, which contains several common elements that might be encountered in everyday practice. Mr M. is an 84-year-old widower living alone. His medical history includes diabetes with mild peripheral neuropathy and coronary artery disease with a remote myocardial infarction (MI). His daughter telephones you to report that over the past 6 months Mr M. has become repetitive and has been making increasingly frequent errors in banking activity and medication use. Before you have a chance to assess him, he is admitted to hospital with delirium, hyperglycemia, hypotension secondary to dehydration and medication overuse, syncope, and a non–ST-segment elevation MI. Mr M. experiences several bouts of sustained, hemodynamically significant ventricular tachycardia (VT) and is eventually fitted for an implantable cardioverter defibrillator (ICD). He is found to have triple-vessel disease, which is not amenable to any revascularization procedure, and has a left ventricular ejection fraction (EF) of 28%, with moderate to severe mitral regurgitation; he is stabilized after beginning a regimen of acetylsalicylic acid, a statin, a β-blocker, amiodarone, an angiotensin-converting enzyme inhibitor, and a nitrate. Upon discharge, Mr M. and his daughter are told that he “should not drive for a few months” and that you, his family physician, will have to decide when it is safe for him to drive. When you see him, he asks when he can resume driving. Notable findings on examination include symptomatic postural hypotension, slow mentation, and a Mini-Mental State Examination score of 22 out of 30. He denies any symptoms of angina and has New York Heart Association (NYHA) functional class II symptoms. His most recent ICD check was unremarkable, with no evidence of recurrent sustained arrhythmias or delivery of device therapies. What should you do? When faced with complex cases, general lists such as the CanDRIVE mnemonic presented in Figure 1 can have limitations. Figure 1 does not represent a scale with a scoring template, but rather a guide to what information physicians should gather to allow them to best employ their clinical judgement regarding fitness to drive. Furthermore, general lists such as this do not provide guidance on how to sequence complex assessments. Adapted from Molnar et al1 with permission. A helpful addendum can be borrowed from the decades-long history of dividing medical conditions into acute versus chronic conditions, which has inevitably been adapted to ascertain medical fitness to drive.1,10,13 A further enhancement of the acute versus chronic distinction is to divide the problems identified into acute intermittent and chronic persistent disorders. Chronic persistent disorders can be further divided into reversible versus irreversible conditions. Acute intermittent disorders—known as “acute or fluctuating illnesses” in the CanDRIVE mnemonic—are medical problems that can suddenly incapacitate an otherwise low-risk driver. The symptoms associated with these conditions (eg, syncope, seizures) can cause sudden changes in cognition or level of consciousness but cannot be detected by examination, as they are not present most of the time. Decisions regarding when patients can resume driving are based on the probability of recurrence. Chronic persistent disorders are medical problems that are present at all times and can be detected by examining and testing patients. In the case of Mr M., first decide when he might resume driving based on the diagnosed acute intermittent disorders (eg, post-MI, arrhythmia treated with ICD). This will provide time for recovery from any associated chronic persistent features that might be reversible (eg, delirium, postural hypotension), allowing for a more accurate assessment of irreversible chronic persistent conditions (eg, dementia). To demonstrate, we will discuss each of these issues in turn. Private drivers (ie, those with noncommercial licences) who have suffered non–ST-segment elevation MIs with substantial left-ventricle damage can resume driving 1 month after the event, presuming there are no additional comorbidities that impose a longer waiting period. This recommendation is based on the rapidly decreasing risk of serious arrhythmias, myocardial rupture, and symptomatic heart failure after the first month, and allows a “stabilization” phase for new medical therapy. If patients have undergone coronary artery bypass grafting, they must wait 3 months before resuming driving. In addition to having suffered a recent MI, the patient was also found to have substantial cardiomyopathy, with an EF of 28%. The moderate to severe mitral regurgitation indicates that some of the EF might be moving in a backward direction, and that the forward EF is likely less than 28%. While ischemic cardiomyopathy is a persistent condition, the risk posed in a driving context is that of cardiac arrhythmias and sudden death—acute intermittent conditions. Patients with severe cardiomyopathy who are private drivers face no restriction if they have NYHA class I (ie, no symptoms and no limitation in ordinary physical activity), class II (ie, mild symptoms [such as mild shortness of breath or angina] and slight limitation during ordinary activity), or class III (ie, marked limitation in activity due to symptoms, even during less-than-ordinary activity such as walking short distances) symptoms. In contrast, commercial drivers with an EF of less than 35% are no longer eligible for licensure, and commercial drivers with NYHA class III or IV (ie, severe limitations, with symptoms experienced even while at rest) symptoms are deemed ineligible to drive regardless of their EF. The patient suffered hemodynamically unstable VT and was implanted with an ICD for secondary prevention indications. The presence of VT makes the patient ineligible to drive for 6 months (during which time there must be no recurrences). The implantation of the ICD for secondary prevention also imposes a 6-month restriction. The Canadian Cardiovascular Society guidelines state that when more than one disqualifying medical condition is present at the same time, the most restrictive recommendation is to be applied (level III consensus).12 Therefore, for this patient’s cardiac disease portfolio, a 6-month suspension from driving is recommended, during which time he must have no recurrence of his VT, must not have another MI, and must not deteriorate to NYHA class IV symptoms. In the period following discharge from hospital, residual delirium is a concern. Florid delirium is characterized by the following features: sudden onset and short duration; new-onset unpredictable hourly fluctuations in cognition; new-onset hallucinations; decreased attention or concentration; and changes in level of consciousness. When patients recover from such obvious deliriums in hospital, it can still take weeks to months for their mentation to return to normal. Many suffer from a slowly resolving subclinical delirium, which presents as slow mentation, decreased attention (ie, decreased focus), and altered scores on cognitive tests. Those with an underlying dementia are more prone to developing delirium (ie, recurrent delirium or delirium precipitated by minor stresses are red flags suggesting underlying dementia). When such patients become delirious, the delirium often takes longer to resolve (weeks or months) and resolution might be incomplete, leaving them with permanent cognitive loss. The dementia is often “unmasked” by the delirium, leaving family members with the impression that the dementia began during hospitalization. In Mr M.’s case the slow mentation suggests delirium, and the history of cognitive difficulties over the previous 6 months suggests an underlying dementia. It would be reasonable to tell the patient that he cannot drive for 6 months owing to his cardiac issues, during which time his noncardiac issues can be assessed and treated (Figure 1). During this recovery time, the physician can wean Mr M. off medications that might be contributing to the delirium (eg, benzodiazepines, narcotics), search for and treat reversible causes (eg, infection, postural hypotension [Box 1]), and decide if it is safe for Mr M. to continue living alone (eg, assess risks of malnutrition, medication errors, falls, fire, and inability to address emergencies). Should relocation to a supervised setting become necessary, the family can be directed to online resources (such as “Home to Retirement Home: A Guide for Caregivers of Persons with Dementia,” available from www.rgpeo.com/en/resources/RRR_Guide_Sept_09.pdf). As the delirium clears in a safe setting, the physician can assess the patient to determine if he has an underlying dementia. ADL—activity of daily living, CMA—Canadian Medical Association, IADL—instrumental activity of daily living, MOT—Ministry of Transportation, OTC—over the counter. 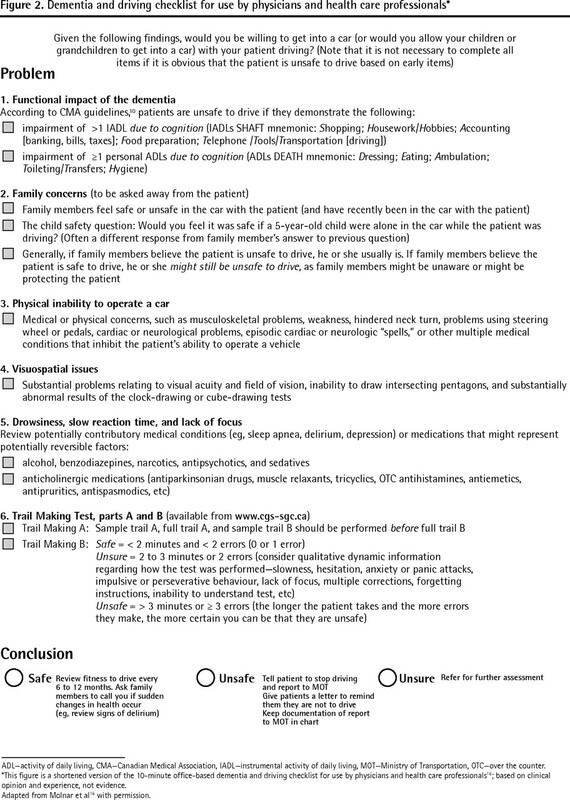 *This figure is a shortened version of the 10-minute office-based dementia and driving checklist for use by physicians and health care professionals16; based on clinical opinion and experience, not evidence. Adapted from Molnar et al16 with permission. The true clinical challenge lies in the assessment of patients with mild dementia who require individualized assessment (grade B, level III evidence).11 In persons with mild dementia, the approach to assessment is relatively unstudied—a recent systematic review has demonstrated that no in-office cognitive tests have well-validated cutoff scores predicting fitness to drive in dementia (level I evidence).17 In recognition of this “evidence-based vacuum,” the Canadian Institutes of Health Research has funded a 5-year longitudinal prospective cohort study (www.candrive.ca) to derive and validate screening tests for fitness to drive that can be employed in front-line clinical settings. While we wait for the results of this research study, physicians can consider employing the experience-based approach to the assessment of fitness to drive in dementia depicted in Figure 2.10,16 This figure does not represent a scale with a scoring template, but rather a practical sequence of steps to follow to gather information, allowing physicians to best employ their clinical judgment regarding fitness to drive. Common causes of postural hypotension: 3D-AID acronym. Some patients’ fitness to drive might be too borderline to assess in a clinical setting; they will require on-road testing (grade B, level III evidence).11 When sending persons with dementia for on-road testing, it is important to let them know that if they pass they might need to repeat the on-road test every 6 to 12 months as the dementia progresses.18 Many patients will not pursue on-road testing when informed of this possibility. The cost of specialized comprehensive on-road tests varies from $50 to $800 (to be paid by the patient), depending on the province. The high costs in some provinces might discourage physicians from assessing fitness to drive, as it places physicians in the undesirable position of presenting patients with an ultimatum: pay for expensive on-road tests or stop driving. This type of interaction is destructive to physician-patient relationships and is unfair to patients of limited financial means. This barrier must be addressed at the provincial level by either improving funding to ministries of transportation so they can fund comprehensive on-road testing or involving organizations that would financially benefit from better funding of comprehensive on-road testing. When people are involved in car crashes, it is the ministries of health and the insurance industry that pay the extremely high immediate and long-term costs of care and disability. The health care system and the insurance industry could potentially save taxpayers and investors millions of dollars by funding comprehensive on-road tests. In order to improve access to well-funded on-road testing, medical organizations and patient advocacy groups need to push for such a shared-payer system. For more information on cardiac illness and fitness to drive, please refer to the Canadian Cardiovascular Society’s Assessment of the Cardiac Patient for Fitness to Fly and Drive final report: www.ccs.ca/download/consensus_conference/consensus_conference_archives/2003_Fitness.pdf. Assessing fitness to drive is challenging at the best of times. When one encounters layered comorbidities, as demonstrated in the case presented here, the assessment becomes even more difficult. This article provides clinicians with systematic approaches to working through such complex cases. For those interested in learning more about assessment of fitness to drive in patients with cognitive and cardiac issues, a number of resources exist. Dr Simpson is supported by an operating grant from the Heart and Stroke Foundation of Ontario. Assessment of fitness to drive is an important societal role for family physicians, and can help prevent further injury to patients and others; however, if a patient presents with multiple comorbidities, assessment can be difficult. To better organize their assessments of fitness to drive, physicians should divide conditions into acute intermittent (ie, not usually present on examination) and chronic persistent (ie, always present on examination) medical conditions. They should further divide the chronic persistent conditions into reversible and irreversible disorders. Decisions regarding fitness to drive in acute intermittent disorders are based on probability of recurrence, while decisions in chronic persistent disorders are based on functional assessment. Guidelines are available for assessing fitness to drive for various conditions; for patients with multiple affecting factors, the most restrictive recommendation should be applied. Some patients’ fitness to drive might be too borderline to assess in office; these patients often require on-road testing, which can be costly. Funding strategies to reduce costs of comprehensive road testing should be examined further. L’évaluation de la capacité de conduire est un rôle sociétal important pour le médecin de famille puisqu’il peut contribuer à prévenir des blessures éventuelles aux patients comme aux autres personnes; cette évaluation peut toutefois s’avérer difficile lorsque le patient présente plusieurs états de comorbidité. Afin de mieux gérer son évaluation de la capacité de conduire, le médecin devrait distinguer les conditions médicales aiguës intermittentes (c.-à-d. généralement absentes lors de l’examen) et les conditions chroniques persistantes (c.-à-d. toujours présentes lors de l’examen). De plus, il devrait diviser les conditions chroniques persistantes en réversibles et irréversibles. Dans le cas de problèmes aigus intermittents, la décision concernant la capacité de conduire dépendra de la probabilité de récurrence, alors que dans les conditions persistantes, elle sera basée sur l’évaluation fonctionnelle. Il existe des directives sur l’évaluation de la capacité de conduire dans différentes conditions médicales; pour les patients qui présentent plusieurs facteurs de risque, les recommandations les plus restrictives devraient être appliquées. La capacité de conduire de certains patients peut être difficile à évaluer au bureau et une évaluation de la conduite sur route est parfois nécessaire, ce qui peut être onéreux. Il faudrait penser à des stratégies de financement pour réduire le coût de ces tests sur route. Drs Molnar and Simpson contributed to the literature search and to preparing the manuscript for submission.
. In-office evaluation of medical fitness-to-drive. Practical approaches for assessing older people. Can Fam Physician 2005;51:372-9.
. Driving and epilepsy. A review and reappraisal. JAMA 1991;265(5):622-6.
. Views of British neurologists on epilepsy, driving, and the law. Lancet 1983;1(8321):401-4.
. Viewpoint of a driver with epilepsy. Epilepsia 1994;35(3):665-7.
. Epilepsy and driving: attitudes and practices among patients attending a seizure clinic. J R Soc Med 1993;86(10):566-8.
. Accident experience and notification rates in people with recent seizures, epilepsy or undiagnosed episodes of loss of consciousness. QJM 1995;88(10):733-40.
. Cross sectional study of reporting of epileptic seizures to general practitioners. BMJ 2000;320(7227):94-7.
. Reporting epileptic drivers to licensing authorities is unnecessary and counterproductive. Ann Emerg Med 2002;39(6):656-9.
. Mandatory physician reporting of drivers with cardiac disease: ethical and practical considerations. Can J Cardiol 2004;20(13):1329-34.
. CMA driver’s guide. Determining medical fitness to operate motor vehicles. 7th ed. Ottawa, ON: Canadian Medical Association; 2006. Available from: www.cma.ca/index.cfm/ci_id/18223/la_id/1.htm. Accessed 2010 Sep 28.
. Recommendations. Montreal, QC; 2007. Available from: www.cccdtd.ca/pdfs/Final_Recommendations_CCCDTD_2007.pdf. Accessed 2010 Sep 28.
. CCS Consensus Conference 2003: assessment of the cardiac patient for fitness to drive and fly—executive summary. Can J Cardiol 2004;20(13):1313-23.
. Medical conditions and driving: a review of the literature (1960–2000). Washington, DC: National Highway Traffic Safety Administration; 2005. Report no. DOT HS 809 690. Available from: www.nhtsa.gov/people/injury/research/medical_condition_driving/pages/TRD.html. Accessed 2010 Sep 28.
. Physician’s guide to assessing and counseling older drivers. 2nd ed. Washington, DC: National Highway Traffic Safety Administration; 2010. Available from: www.ama-assn.org/ama1/pub/upload/mm/433/older-drivers-introduction.pdf. Accessed 2010 Sep 28.
. Management of mild to moderate Alzheimer’s disease and dementia. Alzheimers Dement 2007;3(4):355-84. Epub 2007 Sep 17.
. Practical experience-based approaches to assessing fitness to drive in dementia. Geriatr Aging 2009;12(2):83-92.
. Clinical utility of office-based predictors of fitness to drive in persons with dementia: a systematic review. J Am Geriatr Soc 2006;54(12):1809-24.
. Systematic review of the optimal frequency of follow-up in persons with mild dementia who continue to drive. Alzheimer Dis Assoc Disord 2006;20(4):295-7.
. The driving and dementia toolkit for health professionals. 3rd ed. Ottawa, ON: Champlain Dementia Network; 2009. Available from: www.champlaindementianetwork.org/uploads/Resources/kitjune09.pdf. Accessed 2010 Oct 14.